Advanced algebra in the service of contemporary mathematicalresearch-- a unique introduction. * A clear and concise treatment at an introductory level, tested inuniversity courses. * A wealth of exercises illustrating concepts and their practicalapplication. * Effective techniques for solving research problems in the realworld. * Flexibility of presentation, making it easy to tailor material tospecific needs. * Help with elementary proofs and algebraic notations for studentsof varying abilities. 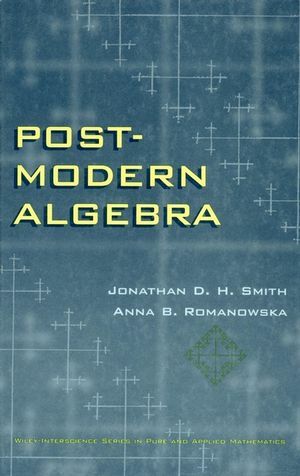 Post-Modern Algebra is an excellent primary or supplementary textfor graduate-level algebra courses. It is also an extremely usefulresource for professionals and researchers in many areas who musttackle abstract, linear, or universal algebra in the course oftheir work. JONATHAN D. H. SMITH is Professor of Mathematics at Iowa StateUniversity. His research interests comprise algebra, combinatorics,and information theory, with applications in computer science,complex systems, physics, and biology. He has published more thansixty research papers and written or edited six books. ANNA B. ROMANOWSKA is Professor of Mathematics at WarsawUniversity of Technology. Her research interests include universalalgebra, lattice theory, and logic, with applications in computerscience and music theory. She has published fifty-five researchpapers and written or edited three books. Algebra: The Central Discipline of Mathematics. Sets with Structure and Sets Without Structure. General Algebra and Linear Algebra.